We wanted the change to be as smooth and transparent as possible for our existing users. 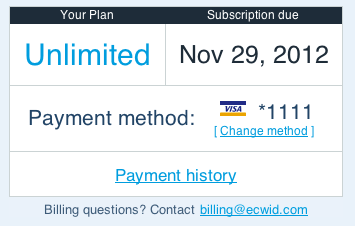 If you registered before the release of Ecwid 13.0 (i.e. before October, 30 2012), you will continue to receive the same level of service you currently receive today and until forever. There will be no change to the current features or pricing you receive. After the initial announcement of new plans we have received a lot of great feedback from you, our Ecwid community. Thank you all. Your feedback, kind words and support help us greatly. These plan changes will benefit the whole Ecwid community. We’ve added a very anticipated feature: product types and attributes, also called extra fields. Sometimes default product fields such as product name or description aren’t enough to display all necessary information about your products. Attributes solve this problem. They are custom product detail fields that show additional information of the product to your customers. However what if you have different products that require different attributes? Then you should use product types. Product types are groups of products which share the same attributes and properties. The most popular examples of product types and attributes are Books with ISBN, Number of Pages, Author; Apparel with Brand, Season, Material, Gender, etc. For your convenience all product types have two default attributes that we consider the most commonly used. UPC — unique product identifier which is called EAN in Europe, JAN in Japan and ISBN for books. And Brand — brand or manufacturer of the product. 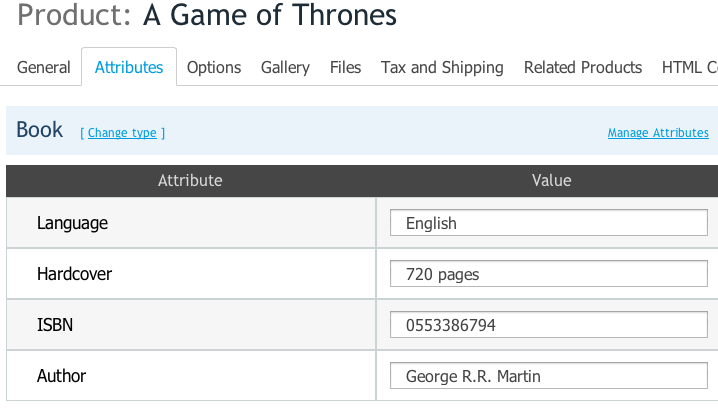 While these attributes are default and cannot be deleted, you can rename them to the more suitable name, for example Brand can be renamed to Author for books or hidden completely from the storefront. 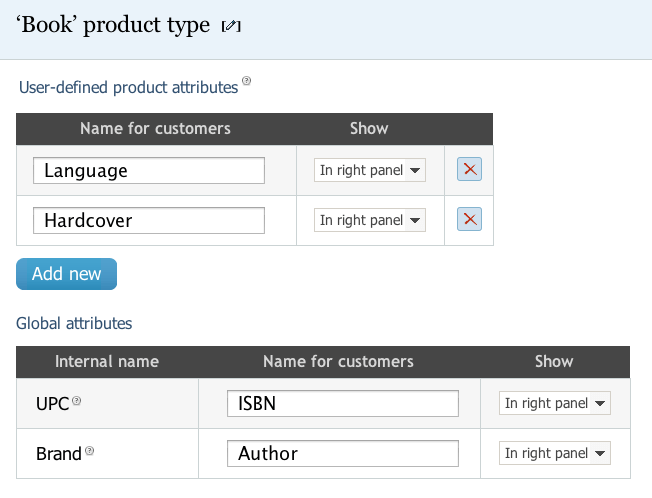 You can create your own custom product attributes and types on the Catalog — Product types page in your Ecwid control panel and assign attribute values to products on the Attributes tab on the product edit page. The more information a customer has about a product, the more probable he or she will buy it. However this feature is something more that just a tool to display additional information about your items. It’s also a way to structure your products and add meta information to them. This feature is the first step and foundation of other great features such as export to different marketplaces(Google Products, Amazon, etc) as well as faceted search with filters. All these next features will use product types and attributes as the source of the information about items and their attributes. You don’t need to change anything — the transition is smooth. All old URLs and existing links to your store will work just fine. Even if you used an old URL notation to create custom menus or links to your store, the links will work just fine. This change was made to support the Google’s AJAX Crawling API for native indexing AJAX applications. This will significantly improve the indexation of Ecwid stores. To comply with this API, it is also requires a small change of your site as well — the updated versions of our WordPress plugin, Joomla extension and PHP module for custom-built sites will be released shortly. Ecwid is really unique in its approach and concept. It has advantages from both worlds: dynamic AJAX and old-school plain-HTML. It is faster than usual shopping carts, can be installed to any website and mirrored to many places because of its AJAX nature. And now it can be natively indexed by Google just as usual HTML website. If you get a lot of new orders every day (congratulations, by the way : -), printing them one by one will take a lot of your time. Not anymore. Just select all the necessary orders, press Print selected and print all invoices at once. Great tool to automate repeating tasks and save your time for more important things, such as promoting your site to get more sales. Ecwid now supports Remarketing with Google Analytics. It lets you follow up with people who have already visited your website, and deliver ad content specifically targeted to the interests they expressed during those previous visits. For example, a group of visitors who spent time investigating specific products but didn’t add anything to their shopping carts might be swayed by additional ads for those same products. A group of visitors who added items to their shopping carts but didn’t complete the purchase cycle might be enticed with a coupon for free shipping or a discounted price. A group of visitors who have made purchases have demonstrated not only an interest in your products, but a willingness to buy, and so you have an opportunity to cross sell other products in which they may be interested. This feature can be enabled on the System Setting — General — Store profile page in the Ecwid control panel. Remarketing with Google Analytics is an incredibly effective way to take advantage of all the rich data you have in Google Analytics and use it to improve your AdWords campaign performance. 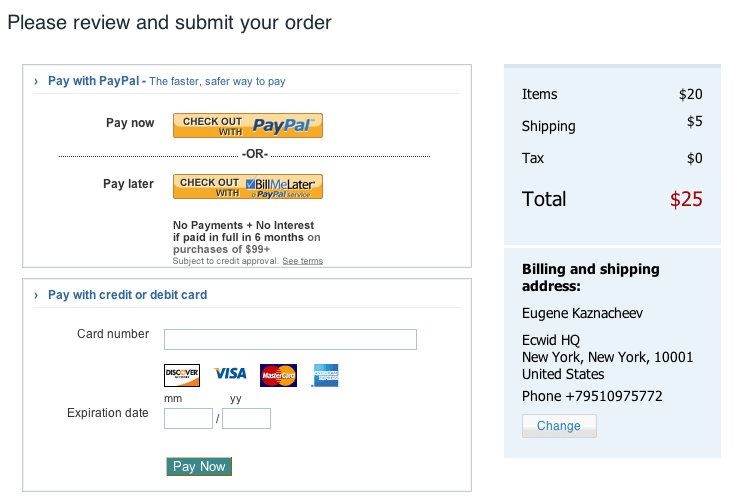 Ecwid now supports one more PayPal product: PayPal Payflow Link. This payment gateway allows you to accept credit cards online using your existing merchant account. What makes this gateway really different is that it allows Ecwid merchant to accept credit card without leaving your checkout pages! It is something that our customers wanted to have since the first Ecwid version has been released. Some merchants want to have a total control over checkout process and don’t want to redirect a customer to a payment gateway to finish the transaction. PayPal Payflow Link is a perfect choice for them now. This gateway also has built-in support of PayPal’s Bill Me Later option. Bill Me Later is a credit line that’s built-in to a customer’s PayPal account. With a Bill Me Later credit line, customers can buy now and pay later with special financing for 6 months on purchases of $99 or more. Customers simply select the Bill Me Later option on your checkout page, enter two pieces of information, accept the terms, and get an approval decision in seconds. Best of all, Bill Me Later customers tend to spend more and buy more often—increasing your sales and average order value. As the merchant, you get paid right away — funds are deposited into your PayPal account within minutes. We’ve optimized the loading of the main image on the product details page. It is now faster than ever making the product browsing a wow it is so fast experience. 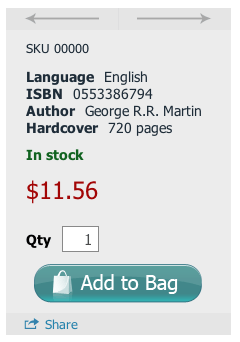 The icon of the Share section in the storefront has been changed to more familiar for your customers. It will lead to more tweets, shares and likes of your items. When you upload a product or category image in the control panel, you now don’t need to hit the Upload button — as soon as you select the image on your computer, it starts to upload automatically. If you upload many images, not having to do an extra click will save you a lot of valuable time. You can now easily share your products to your Facebook page or Twitter right from the control panel. Social media is widely recognized as an effective source for new customers. Sharing new items on Facebook will bring you more traffic and sales. If you have a FB page, we’d also recommend you to add your Ecwid store to it. Please check the article in USA Today why it matters. Easier product navigation in the control panel — we’ve added Next / Previous product navigation links there, so you can browse your items in the control panel more quickly and conveniently. Prior to this new feature, if a store owner wanted to browse all items in a specific category, he or she would need to open a product details page, then go back to the upper level, then open the next product and so on. This was not ideal . That’s why we added these links, so now you can easily press the Next product link and the next product is loaded instantly. 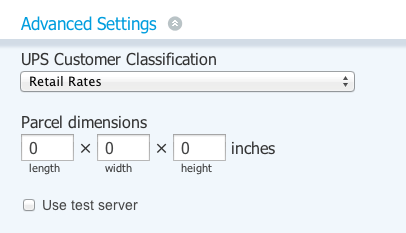 You can now set your package dimensions for UPS, USPS, Canada Post and FedEx to get more exact automatic carrier-calculated rates. New This product requires shipping option. Before Ecwid treated all items with empty weights as intangible ones and didn’t ask for shipping address for such items. Sometimes merchants forget to set up weights and wondered why aren’t shipping rates appearing. Now it is a separate option, so it will make product setup easier for new merchants. We’ve worked hard to release all these new great features. Feel free to use and enjoy them.